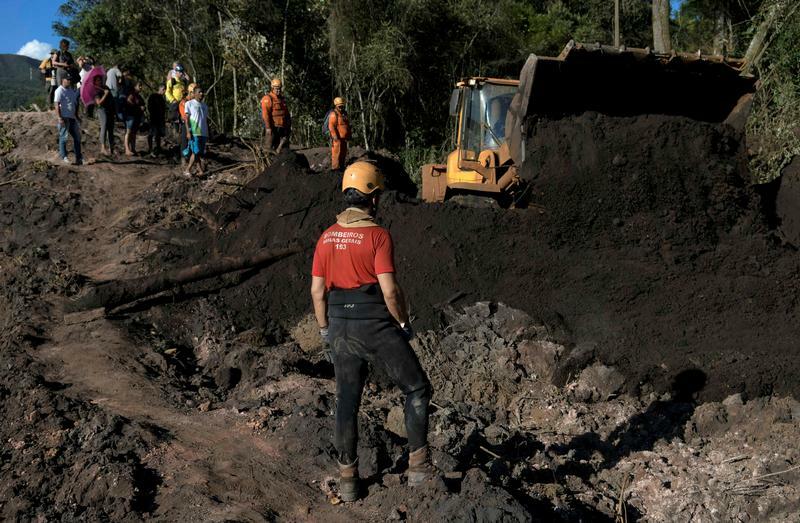 Members of a rescue team search for victims after a tailings dam owned by Brazilian mining company Vale SA collapsed, in Brumadinho, Brazil January 28, 2019. A dam collapse at Vale’s Córrego do Feijão mine on Jan. 25 sent a mudslide through its facilities and homes in the nearby town of Brumadinho, killing at least 65 people and leaving 279 unaccounted for. Brazil’s top prosecutor, Raquel Dodge, said on Jan. 28 that the company should be criminally prosecuted and executives could be held personally responsible. Brazilian courts have already issued orders to freeze 11.8 billion reais ($3.1 billion) in Vale’s accounts to cover rescue efforts and damages. Brazil’s stock market was closed on the day of the disaster, but the company’s shares fell by almost a quarter on Jan. 28 to close at just under 42.7 reais, their steepest daily drop in percentage terms. A 2015 dam collapse at Samarco, a joint venture between Vale and BHP, killed 19 people and caused substantial environmental damage. Vale had said the operation could restart as early as 2020.